Today's RVs require plenty of space. RV park designs need to be functional, fun and focused. Customers today expect many amenities and view the RV park as not just a place to stay for the night, but also a place to enjoy themselves and be entertained, according to Small Business Development Center (SBDC) National Information Clearinghouse. (See References #1 P2) The numbers of RVers who stay at destination parks for their entire vacations is on the rise according to the California Association of RV Parks and Campgrounds. (See References #2) These parks need to supply a range of activities for enjoyment and exercise. Good RV park designs take advantage of the natural surroundings and make them strengths, says Foresight Management Group, RV park consultants. (See references #3 P1). Parking spaces nestled in trees provide relief from the heat with a touch of privacy, while low growing bushes and shrubs between spaces offer a sense of separation. Take advantage of any water features like streams, ponds and rivers by placing the spaces next to them. Leave a buffer though to provide a walking area along the water for customers who want to walk or run for exercise and refreshment. Todayâ? 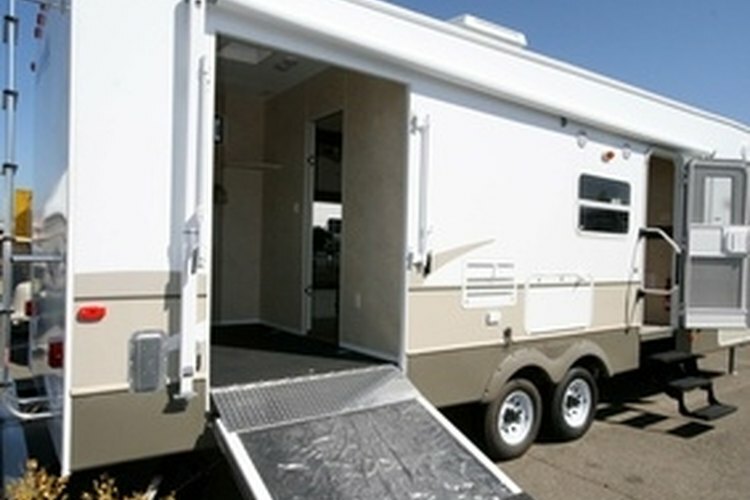 ?s large RVs are an important segment of the market, according to the SBDC, and it is very important to provide enough space for maneuvering. (See References #1 P3)Make curves wide with gradual arcs and minimal turns. Wherever a street dead ends create a generous turning circle to reduce the need for backing up. Make the spaces pull-through spaces so drivers pull in from one end and drive out the other. Use one-way streets to make this efficient. Leave ample room on the curbside, passenger side, of the RV space for awnings to open and for a picnic area. Place utilities together to reduce the need for cords and hoses to be strung out on the driverâ? ?s side of the RV. Create a wide entrance and exit and leave ample space for several rigs to be parked during registration. Since most RV parks now offer â? ?an amazing array of amenities,â? according to Northern Arizona University, donâ? ?t get left behind in this category. (See References #4) Use dead space that will not work for RV spaces for added attractions. Gazebos with barbecue grills make places where groups can gather. A playground offers space for children to commune and exercise. Wooded areas too dense or rough to develop are prime places to put walking and biking trails. Develop open and grassy areas for badminton, croquet, softball and other group sports activities. rnrnDonâ? ?t forget amenities for people who prefer the indoors. Game rooms set aside for arcade games not only provide activities but they also generate income. Set up a separate, quieter area where people can play cards and board games. Consider setting up a theater room for showing new release movies. Include a store that stocks all the things campers need.